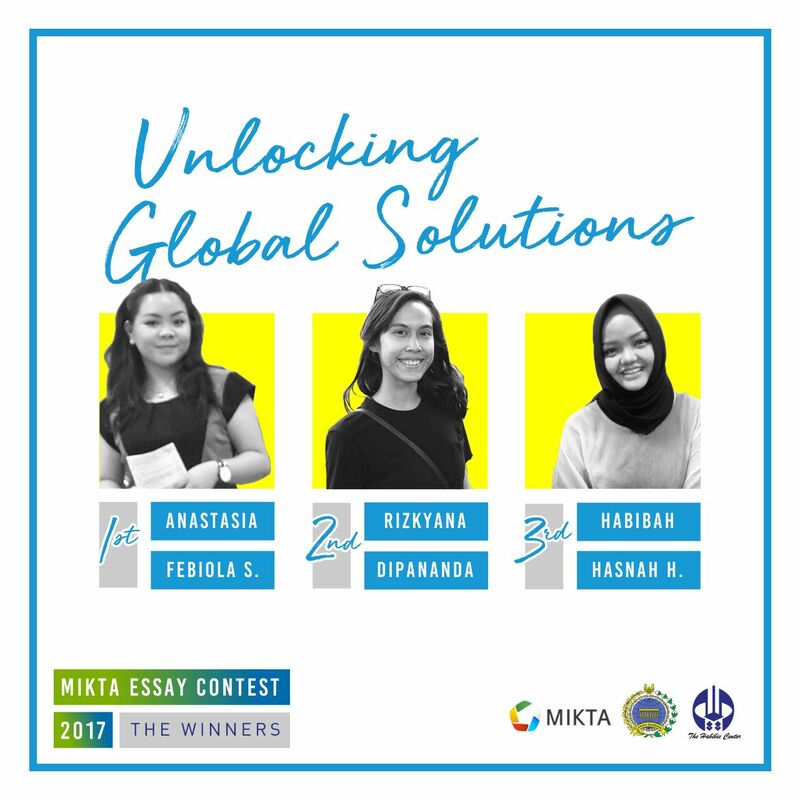 One of the students of the Department of International Relations at Bina Nusantara University, Anastasia Febiola S., won an essay contest on MIKTA. MIKTA is an informal partnership between Mexico, Indonesia, Republic of Korea, Turkey, and Australia led by the Foreign Ministers of each country. It was created in 2013 on the sidelines of the United Nations General Assembly (UNGA) in New York City and aims to support effective global governance. The essay contest was held by The Habibie Center (THC), a think tank set up by B. J. Habibie and family in 1999 to promote the modernization and democratization of Indonesian society. The contest was held to ask how will MIKTA be able to realize its goal of responding to various global governance challenges, from security issues such as violent extremism to humanitarian concerns such as refugee issues. Anastasia won the contest with the best and original essay. Her article is as follows. International Relations, Faculty of Humanities of Bina Nusantara University, Indonesia. ABSTRACT The strategic environment development in the 21st century is facing numerous challenges and call for the need of a new platform to address the issues, thus bring together the 5 middle and regional powers – Mexico, Indonesia, South Korea, Turkey, Australia (MIKTA), to address the global challenges through negotiation and dialogue. This writing highlights an essential way for the cross-regional partnership to meet its goal and briefly explain the reason why is it an essential way. In the end, this writing exposes 2 categories of plausible challenges for the partnership to face within the efforts to reach the objectives. Keywords: MIKTA; global governance; middle powers; cooperation; partnership; cross-regional; strategic environment; middle powers; security. The strategic environment in the 21st century is facing various challenges of transnational phenomena, such as the climate change, global security, and geopolitical rivalries. These transnational phenomena require approaches from transnational cooperation which has become the trend in today’s political climate, including MIKTA. It serves as an informal cooperation, partnership, and a cross regional multilateralism to provide consultative and constructive approaches in the global governance (MIKTA 2015). In the global security domain, the members are facing challenges such as nuclear issue in the Korean Peninsula, wave of refugee from Middle East to Europe, transnational crime in Latin America, terrorism, and maritime security in the Asia Pacific. All these challenges are vital to the national, regional, and international stability. Then what can MIKTA do to respond the challenges in this complex strategic environment in the 21st century? How can MIKTA unlock solutions for these challenges? This writing highlights an essential and crucial way for MIKTA to unlock solutions for the global security challenges, it is to formalized the partnership through an agreement with a set of normative function and mechanism. Why is it requisite for MIKTA to establish a normative mechanism and framework? Below are 3 reasons why. First, it is a stronghold to realize its goals. Assessing global security challenges, like terrorism and nuclear proliferation, it needs to begin with mechanism and the formal attributes. An organization with a clear mechanism and framework could effectively identify and address the issues. It produces more significant results than an informal partnership. The formalization of the group alleviates the implementation process within operational and tactical level, for example in 2015, Indonesian Foreign Minister Retno Marsudi has proposed a counter-terrorism cooperation through exchanging intel and legal data information. The proposal included measurement such as prevention, early detection, legal conduct, and rehabilitation (Wisnu 2015). The proposal is merely an idea, until it comes up with implementation and results. Second, it needs to determine the focus of cooperation for it will only work if it is focused on particular and specific activities (‘functions’) which are currently performed by states but would be performed more effectively in some wider context (Brown and Ainley 2005, 119). MIKTA needs to focus on a particular domain to stress and maximize its approaches on the issues, such as natural gas, security, or economy-security interlinked issues, that could build the confidence of the partnership (Cassidy 2017). For example, MIKTA cooperates with the International Energy Agency (IEA) to discuss on natural gas and reviewing the gas-security issues (International Energy Agency 2017). Moreover, issues in global security domain are multilayered, dimensional, and dynamic. It needs a thorough approach with comprehensive mechanism to implement for it might involve the armed forces as state’s legitimate use of force. Finally, formalization of the partnership is a holistic approach to provide mutual desired resolution and a form of preventive diplomacy with each member’s capability and agreed normative function. In its formal form, the organization could focus its concern on long-term crisis and challenges more than the shortterm ones. The distribution of power in form of organization challenged the traditional modes of conducting foreign policy, transform into a new kind of soft power and diplomacy, which is more effective (Hurrell 2006). For example, the various and different member of BRICS countries established in 2003 agreed to cooperate in trade and business, for they are under a similar or equivalent influence in the international political-economic system (Armijo 2007). The three reasons above briefly explain why is it necessary for MIKTA to formalized the partnership. MIKTA’s member countries are sharing the belief in entitling a more influential role in world affairs (Hurrell 2006). Moreover, the members share 3 characteristics that could boost the integration: democratic system, middle, constructive, and regional powers, and open market (Schiavon and Domínguez 2016). On the calls for contribution resolving the global security challenges, the partnership will undoubtedly face challenges in the future. This writing identifies 2 type of challenges that MIKTA will face. MIKTA countries are diverse geographically and socially, though 3 members are in the Asia Pacific, but each represents widely different condition of politics, economy, and socio-culture, causing different prioritization. For example, South Korea’s initiating the partnership to maintain its independence from the geopolitics rivalry in East Asia, particularly China, North Korea, Japan (Cassidy 2017). While Mexico is also trying to build its independent government from United States’ hostile policy in border security, Trans-Pacific Partnership (TPP) and NAFTA. For Australia, MIKTA is another trade and business instrument to heighten its status between other G20 countries (Clark 2015). For Indonesia, MIKTA is an initiative for confidence building and partnership to increase its role and influence in the region. While for Turkey, MIKTA could help solving its problems such as human security, refugees, and terrorism. The different challenges and priorities from each member countries make it hard for the group to address mutual geopolitics and geostrategic issues. Another challenge is that domestic instability could highly influence the cooperation. The instability, such as insurgencies, political issues, economic recession, maritime security, population growth, urbanization, underdevelopment, public preferences, even crimes could avert the government’s focus from outward looking policy into inward looking policy. Such case happened when President Trump decided to exclusively govern the US from a harmful partnership and involvement in international system, focusing to reduce the number of unemployment and ‘Make America Great Again’, thus withdrew from the TPP which the US itself initiated under Obama’s presidency. These internal challenges require responsibility and commitment from the MIKTA countries, expectedly to increase its willingness and spend more diplomatic effort if it shares the sense of strong political leadership required to address major global challenges, such as terrorism and nuclear disarmament (Jongryn 2015). Mistrust and conflictual background, in such case Indonesia-Australia diplomatic clash in the past need to be casted aside and focus more to capacity and confidence building for the group to work. Moreover, it is necessary for the members to synergized and synchronized the rational calculations of mutual gain through negotiation and dialogue to reach the consensus. The challenges also come beyond the state boundaries and influence the shape of its foreign policy and partnership behavior, that are widely spread by globalization, such as refugee crisis, cybersecurity, and nuclear proliferation issues, that pose long-term impact rather than the internal challenges. These external challenges require longer process to enable actions with varying degree of development and the capability in science, information, and technology in order to present the suitable assessment and approach to handle the issues (Gurry 2013). The current trending issues, such as the threat of terrorism and nuclear proliferation are beyond borders and multilayered. A single approach as how the US declared through its military campaign in Iraq and Afghanistan since 2001 could not solve the challenges. Instead, it causes an endless military operations, precipitate other forms of rebellion, and caused the mass migration of refugee or asylum seekers to the Eurasia. The changing nature of geopolitics is another aspect beyond the state border, presenting challenges for the organization to adapt. The failure of the organization to adapt within the dynamic nature of geopolitics and enforcing inadequate values could diminish its effectiveness, losing members’ trusts, decreasing its capabilities, and in longer terms would fatally dissolve the organization. This happened to SEATO in 1977 when the pact could not adapt to the rivalries of the great powers during the Cold War era. Overall, the most prominent step for MIKTA to unlock solutions for the global security challenges is by formalizing the partnership through an agreement with a set of normative function and mechanism. This is the most prominent step arguably for 3 reasons: 1) it is a stronghold to realize its goals; 2) it will only work effectively if it is focused on specific spectrum; and 3) it is to provide mutual desired resolution. Within the process itself, this writing highlight 2 categories of challenges that the partnership will undeniably face: internal and external challenges. These challenges are complex and dynamic; it demands multilateral approaches instead of individual and exclusive ones. The future of MIKTA is in its contribution, specifically the challenges influencing the members within the complexity of 21st century strategic environment. Armijo, Leslie Elliott. 2007. “The BRICS countries as analytical category: Mirage or Insight?” Asian Perspective 31 (4): 7-42. Brown, Chris, and Kirsten Ainley. 2005. Understanding International Relations. 3rd Edition. New York: Palgrave Macmillan. Cassidy, Fikry. 2017. MIKTA’s Next Steps. September 27. Accessed November 20, 2017. https://thediplomat.com/2017/09/miktas-next-steps/. Clark, Helen. 2015. Australia, MIKTA and the Middle Power Question. April 20. Accessed November 20, 2017. https://thediplomat.com/2015/04/australia-mikta-and-the-middle-powerquestion/. Cooper, Andrew F. 2015. “Beyond the middle power model: Cana in a reshaping global order.” South African Joournal of International Affairs (Routledge) 22 (2): 185-201. Flake, Gordon, and Wang Xu. 2017. MIKTA – The Search for a Strategic Rationale. Report, Perth USAsia Centre, Perth USAsia Centre. Gurry, Francis. 2013. “Challenges for International Organizations and Multilateralism.” Lakshman Kadirgamar Memorial Oration 2013. World Intellectual Property Organization. Hurrell, Andrew. 2006. “Hegemony, liberalism, and global order: what space for would-be great powers?” International Affairs 82 (1): 1-19.
International Energy Agency. 2017. Examining the future of natural gas in MIKTA countries. September 29. Accessed November 20, 2017. https://www.iea.org/newsroom/news/2017/september/examining-thefuture-of-natural-gas-in-mikta-countries.html. Jongryn, Mo. 2015. MIKTA, Middle Powers, and New Dynamics of Global Governance. 1st Edition. New York: Palgrave Macmillan. Kinsella, David, and David L. Rousseau. 2008. “Democracy and Conflict Resolution.” In The SAGE Handbook on Conflict Resolution, by Jacob Bercovitch, Victor Kremenyuk and I. William Zartman, 475-492. Sage. MIKTA. 2015. About MIKTA. May 22. Accessed November 20, 2017. http://www.mikta.org/about/vision.php. Navari, Cornelia. 2008. “Liberalism.” In Security Studies: An Introduction, by Paul D. Williams, edited by Paul D. Williams, 29-43. London: Routledge. Schiavon, Jorge A., and Diego Domínguez. 2016. “Mexico, Indonesia, South Korea, Turkey, and Australia (MIKTA): Middle, Regioal, and Constructive Powers Providing Global Governance.” Asia and the Pacific Policy Studies (John Wiley & Sons Australia, Ltd) 3 (3): 495-504. Tomes, Robert R., and Christopher K. Tucker. 2014. Human Geography: Sociocultural Dynamics and Challenges to Global Security. United States Geospatial Intelligence Foundation, US: USGIF, 246. Wisnu, Arkhelaus. 2015. Indonesia Propose Counter-Terrorism Cooperation with MIKTA. September 28. Accessed November 20, 2017. https://en.tempo.co/read/news/2015/09/28/055704383/Indonesia-Propose-Counter-Terrorism-Cooperation-with-MIKTA.